Yellowstone National Park holds some of the most stunning natural wonders in the United States. Located just outside Jackson Hole, Wyoming, it is known for it’s powerful geysers, picturesque hot springs, waterfalls, lakes, and wildlife. As US citizens and residents, we have traveled much of the United States, but this part of the country is our favorite. Having visited Yellowstone several times, we’ve been able to see and experience many of the top attractions in Yellowstone National Park. To make planning your visit easier, we’ve put together a list of the top things to do in Yellowstone, and provided suggested itineraries for both one day in Yellowstone and 2 days in Yellowstone. Before we jump into the top things to see in Yellowstone, here are a few tips to help plan a fun and safe trip. You will be driving a lot. The top attractions in Yellowstone can often be an hour’s drive from each other. Prepare to stay in the park longer than you expected. Traffic often moves slow as other motorists stop or slow down to take photos. Bison on the roads commonly cause serious delays, as well. Wear tennis shoes and don’t be afraid to hike. Most of the best sights in Yellowstone are not visible by car. Keep young children within arms length when around geothermal features, and never let them stray from the boardwalks or marked trails. Carry bear spray when hiking in the park, particularly in the northernmost areas. While there is a ton of awesome things to do in Yellowstone, you can’t possibly do or see it all. That’s why we’ve narrowed our list down to our favorite sights. Old Faithful is perhaps one of Yellowstone’s main claims to fame. 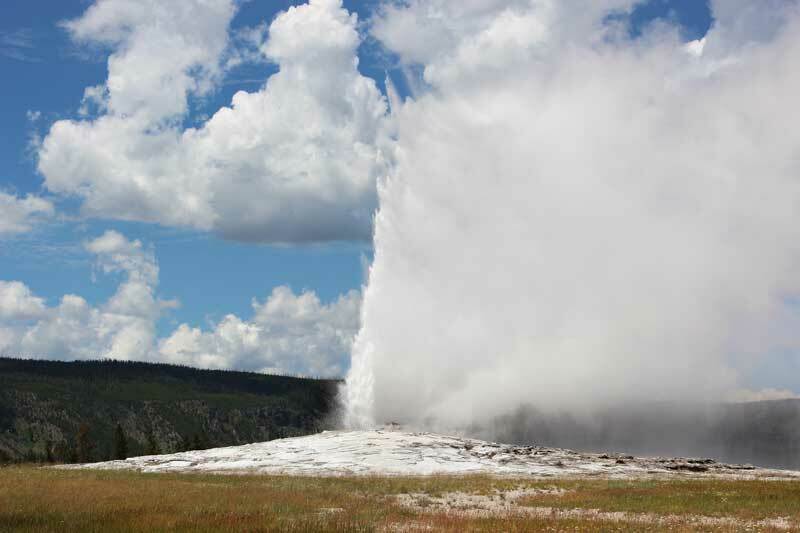 The geyser has been erupting like clockwork since it was first discovered in the late 1800s. The predictable geyser draws crowds of people every 60-125 minutes eager to witness its eruption. 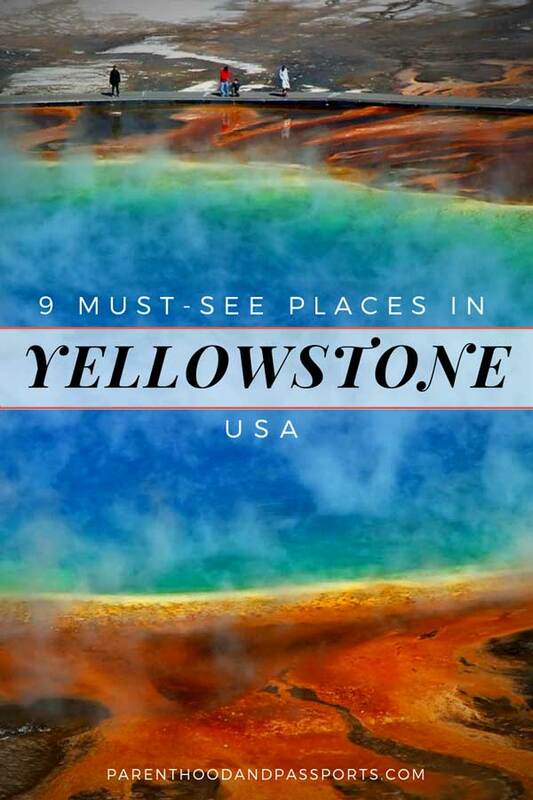 Although one of the most notable things to do in Yellowstone, it is actually one of least exciting things to see on this list. Still, watching Old Faithful spew water high into the air is a must when in Yellowstone. It’s kind of like viewing the Mona Lisa in Paris or seeing the Little Mermaid statue in Copenhagen. It is a bit underwhelming, but you do it to say you’ve done it. Tips for visiting Old Faithful: Waiting for Old Faithful can get very crowded, so if you want a front row seat plan to hang out and sit for about 30 minutes before the geyser actually erupts. Also, be sure to stay on the boardwalk and designated trails around Old Faithful and any of the other geysers or hot springs. The ground is fragile in these areas, and the water underneath is scalding. Keep children close at all times! Adjacent to Old Faithful you’ll find a beautiful hotel and restaurant with a log cabin feel. Old Faithful Inn is a National Historic Landmark and is worth stopping in to see the massive stone fireplace and rustic architecture. Built in the early 1900s using materials primarily gathered from inside the park, it is one of the few log hotels remaining in the United States. 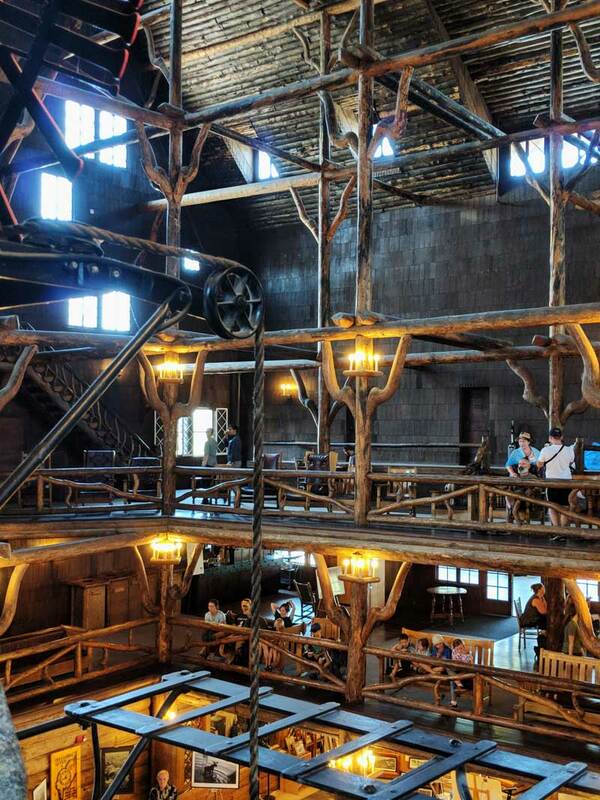 Old Faithful Inn is a great place to stop for lunch before or after viewing Old Faithful blow. Tip for visiting Old Faithful Inn: If you want to stay at Old Faithful Inn, or at any of the lodging facilities within Yellowstone National Park, book as early as you possibly can. The hotels and cabins inside the park fill up fast! A walkway around Old Faithful will take you past several other smaller and beautiful hot springs and geysers that are not to be missed. If you have extra time, take a stroll down the 1.2 mile paved path to Morning Glory, a natural hot spring that tops the highlights in this area called Upper Geyser Basin. The deep hot spring also tells a sad story about the destructiveness of tourism. Once a vibrant blue color, the center of the spring is now a more faded shade of green due to tourists throwing things in the pool and clogging the springs. Tip for visiting Morning Glory (or any of the hot springs): Don’t throw things in the water. Just don’t. The Grand Prismatic Spring is the most colorful place in all of Yellowstone. It is the largest hot spring in the United States and is one of the top things to see in Yellowstone National Park. 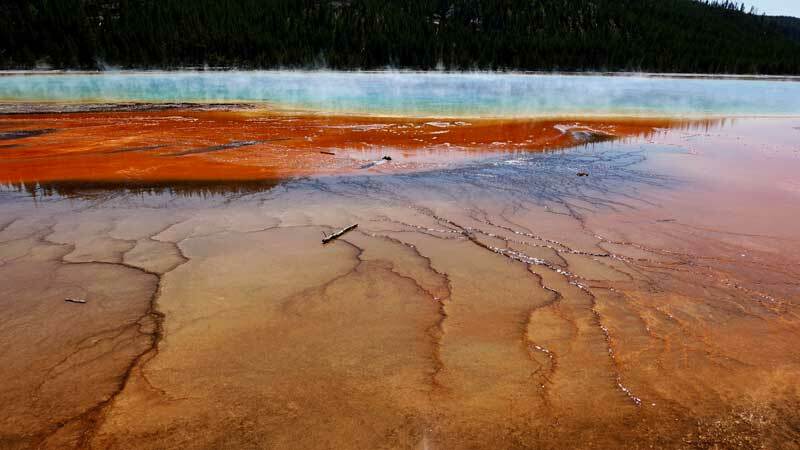 Located in Midway Geyser Basin, there are two vantage points in which to see Grand Prismatic Spring. There is an overlook accessible via a short hike from Fairy Falls. 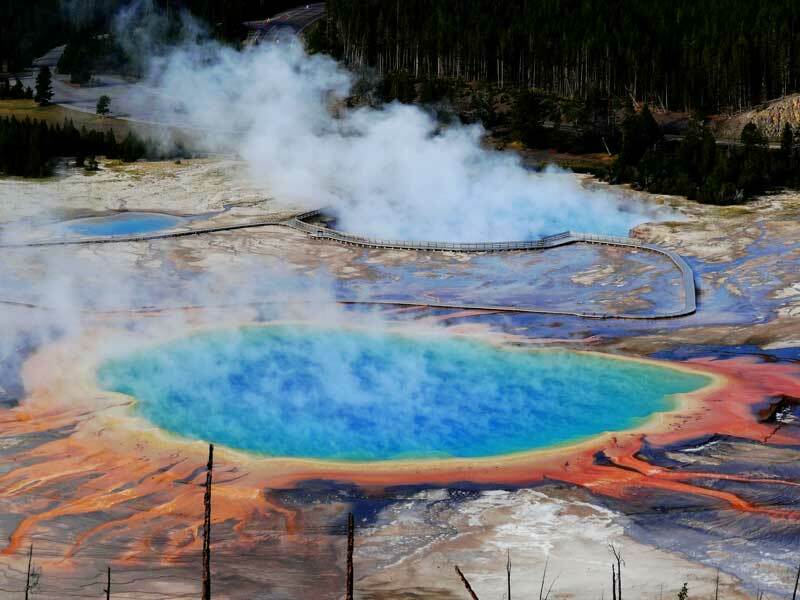 Visiting Grand Prismatic Spring is definitely one of the top things to do in Yellowstone. This will give you a birds eye view of the colorful spring. For a closer look at the spring there is a walkway which takes you directly up to the spring. The walkway also takes you passed Excelsior Geyser, a beautiful blue dormant geyser. Tip for visiting Grand Prismatic Spring in Yellowstone: Grand Prismatic is best viewed in the heat of the afternoon. In cooler temperatures, the steam from the hot spring clouds the view of the colorful wonder. 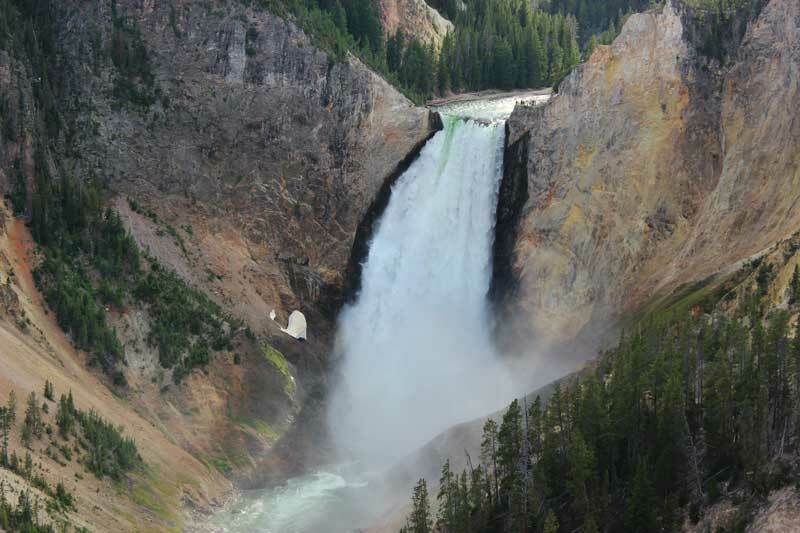 Lower Falls is the most majestic waterfall in Yellowstone, if not in the entire United States. There are three awesome vantage points to see Lower Falls, all of which involve a somewhat challenging hike and can consist of numerous switchbacks and stairs. The best view of Lower Falls, in my opinion, is the Grand View lookout point, pictured below. This look out point gives you a head on view of the amazing water. Uncle Tom’s trail is another shorter hike that offers a good view of the canyon and the Lower Falls. This is a steep hike down 328 steps, and offers a side view of the falls. 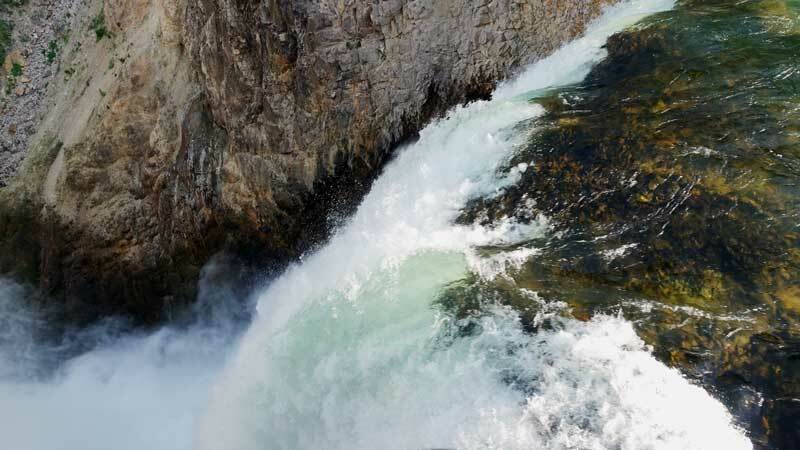 Finally, if you want to see the power of water a little closer, you can also hike to the brink of Lower Falls which allows you to look directly over the edge of the tallest waterfall in Yellowstone. The canyon around Lower Falls is equally beautiful. Known as the “Grand Canyon of Yellowstone” you will be amazed at the red rock walls of this deep canyon carved by water. 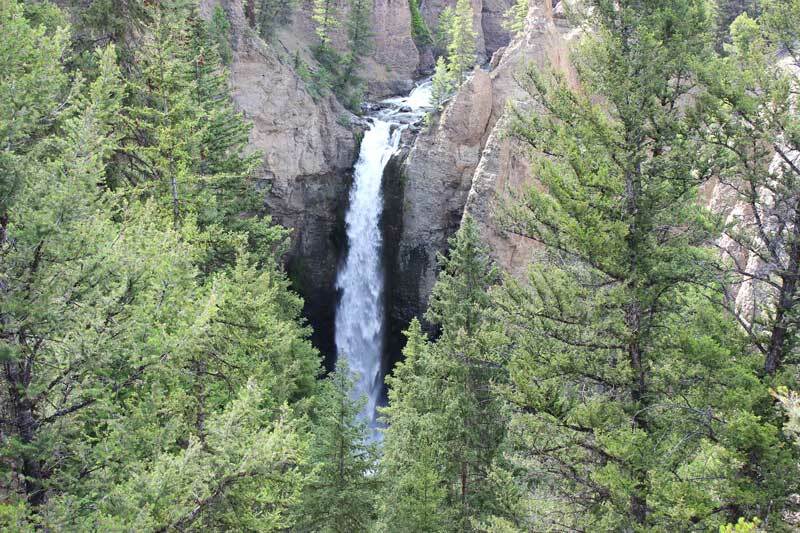 A lovely waterfall in the Northern region of Yellowstone, Tower Fall lives up to its name. Plunging 132 feet from the top of the brink, the waterfall viewpoint is easily accessible via a short walk. Tower Fall gets its name from the tower-like rock columns north of the waterfall. Located in the Northeast corner of Yellowstone, Mammoth Springs is somewhat far removed from some of the other top things to see in Yellowstone, but it is definitely worth visiting if you have more than one day in Yellowstone. The Travertine Terraces at Mammoth Springs are a series of limestone terraces that have a white appearance due to the unique interaction of water and limestone. 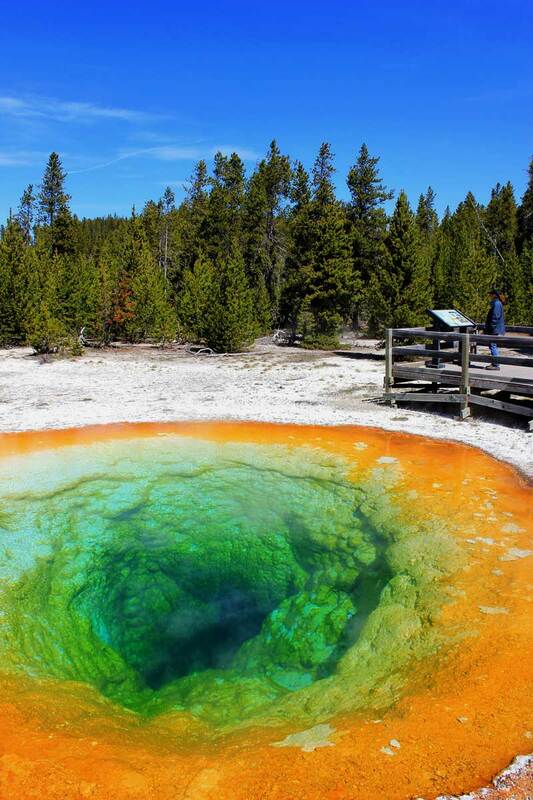 Abyss is another beautiful hot spring found within Yellowstone. 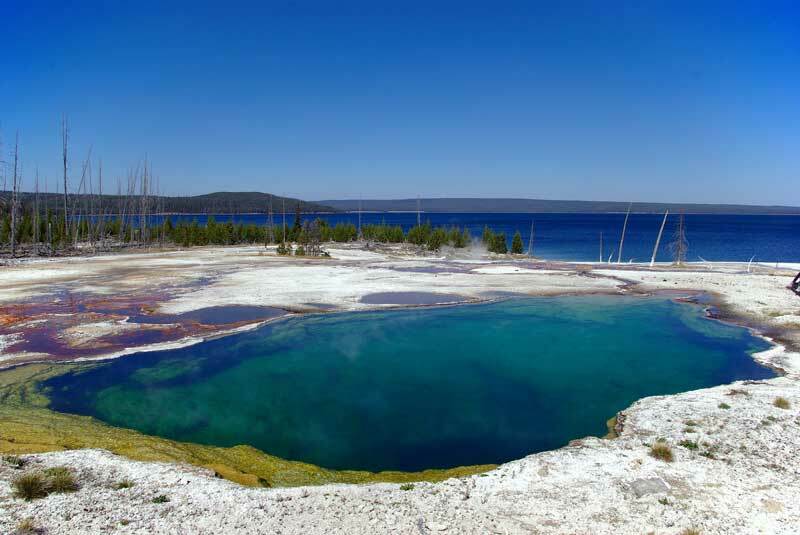 It is located in West Thumb Geyser Basin near Yellowstone Lake. It is one of the deepest hot springs in Yellowstone and a primary feature in West Thumb. The basin is also home to bubbling mud pots, another one of the popular things to see in Yellowstone. One of the best things to do in Yellowstone is to simply take in the natural habitat. Yellowstone is home to 200 different animal species, including bears, moose, and bison. There is always a chance you will spot wildlife while inside the park, but there are a few places where your chances increase. 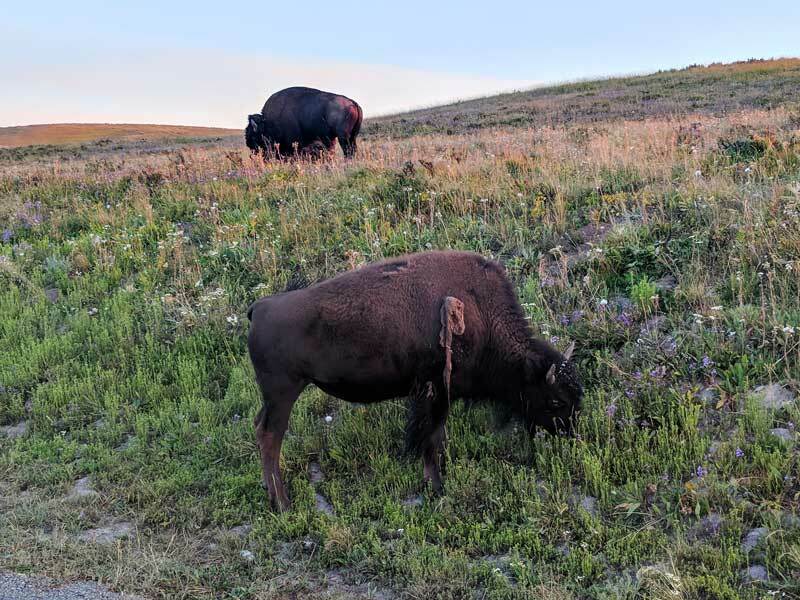 You’re almost sure to see bison in Hayden Valley, an area of the national park between Canyon Village and Yellowstone Lake. In fact, the herds often cause traffic jams in the area when crossing or lingering on the road. Bears are also quite prevalent in the park. Your chances of seeing bears in their natural habitat increase as you head north toward the Wyoming/Montana border and around rivers and lakes. Park rangers try to keep them away from the roads, so it is typically while hiking or doing other outdoor activities that you might see or encounter a bear. Tips for observing wildlife in Yellowstone: Always use cautious when observing wild animals. It’s best to stay in your car or keep a safe distance as wildlife can and will charge if they feel threatened. Bear spray is also recommended when hiking in Yellowstone. Yellowstone National Park is big. Covering nearly 3,500 square miles, it is larger than Delaware and Rhode Island combined. Naturally, it is good to have a route and itinerary planned before you visit. You could spend days exploring the park, hiking, camping, and taking in the sights, but realistically, most people give themselves one or two days in Yellowstone. If arriving from the south entrance which first takes you through Grand Teton National Park, you’ll drive the lower loop, hitting 7 of our 9 favorite places in Yellowstone. Start your day early at West Thumb Geyser Basin, where you will see Abyss, Yellowstone Lake, and some cool mud pots. Head north through Hayden Valley, where you are most likely to spot herds of bison grazing in the fields, and even along the road. Stop at Lower Falls and do one of the three hikes mentioned above. After lunch drive to Grand Prismatic Spring to get a ground level perspective of the colorful hot spring. Next, turn off at Fairy Falls and make the short hike to the Grand Prismatic Overlook. Stop to view Morning Glory in the Upper Geyser Basin. End your day watching Old Faithful erupt and have dinner (or stay the night) at Old Faithful Inn. 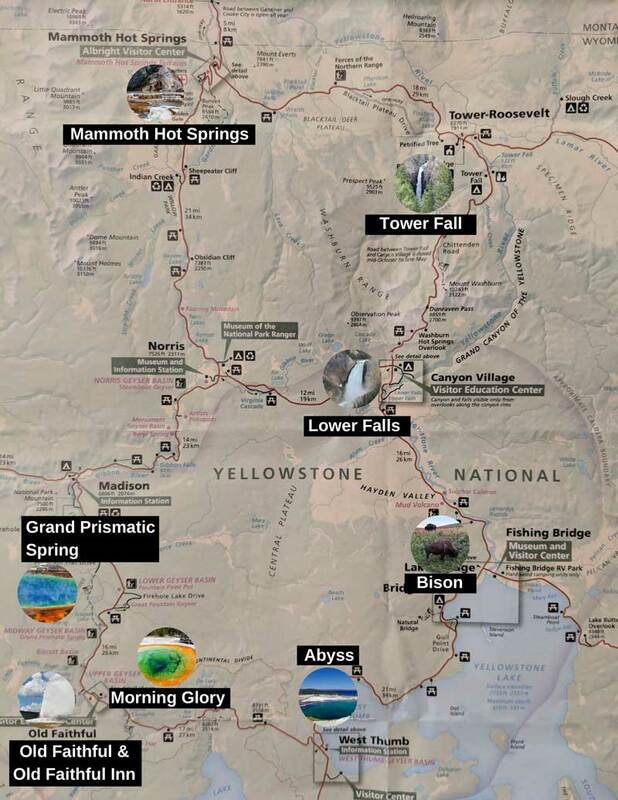 If you plan to spend more than one day in Yellowstone, this two day itinerary will allow you to see all of the top attractions in Yellowstone. You’ll also be able to slow down and enjoy the experience a bit more. Once again, assuming you’ll arrive through the south entrance, this two day Yellowstone itinerary makes the large loop through the park. 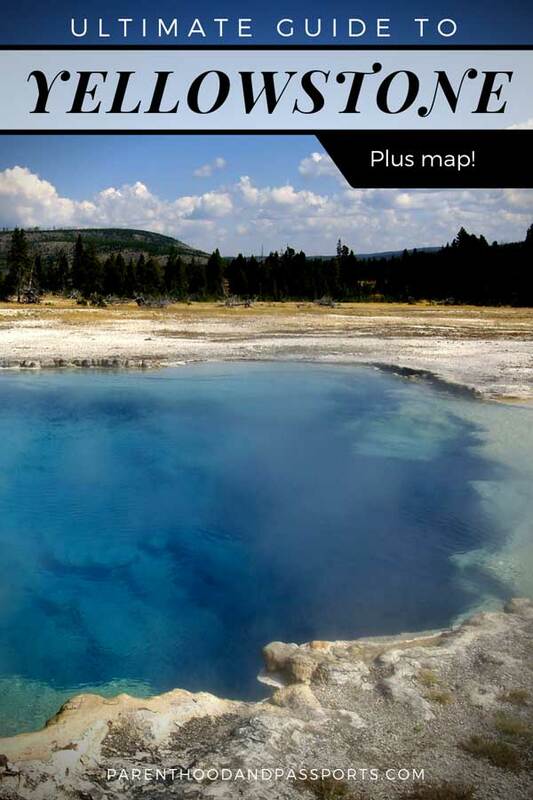 Start at West Thumb Geyser Basin – see Abyss, Yellowstone Lake, and the mud pots. Check out the herds of bison in Hayden Valley. Hike to one of the three lookout points of Lower Falls. Drive north to Tower Fall, where you will do a shorter hike to the lookout point. 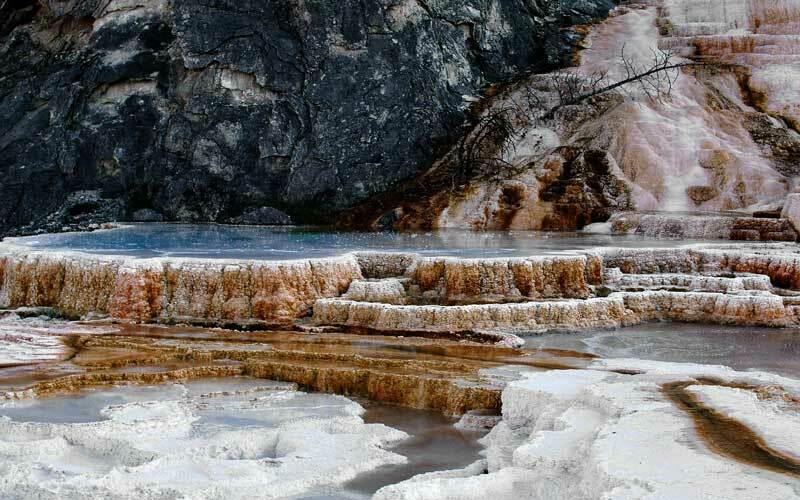 Next, head to Mammoth Hot Springs to see the limestone terraces. Dinner and spend the night at Mammoth Hot Springs Cabins. Drive south, stopping at Norris Geyser Basin to see the Steamboat Geyser, the world’s tallest active geyser. You’re chances of seeing it erupt aren’t great because it isn’t predictable like Old Faithful, but it’s worth a stop to say you’ve seen it. Head to Grand Prismatic Spring next for a ground-level view. Next, stop at Fairy Falls and hike to the Grand Prismatic overlook. Proceed to Old Faithful and have a late lunch at Old Faithful Inn. 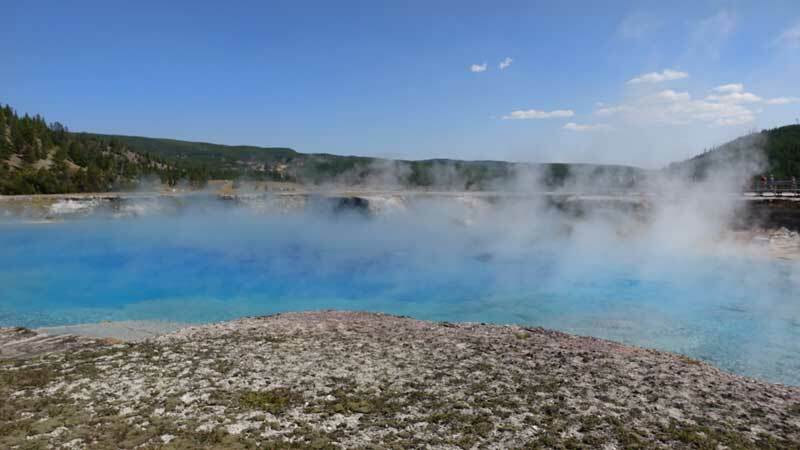 After lunch watch Old Faithful erupt and hike the long route around Upper Geyser Basin to see Morning Glory and many other beautiful hot springs in the area. Dinner (or stay the night) at Old Faithful Inn. If you plan to spend two days in Yellowstone or more, I’d recommend spending the night in the national park. There are nine different lodges or cabins located within the park where you can stay. A word of warning, these book up quickly and are not available year round, since many of the roads into the park are inaccessible during winter. Camping in Yellowstone is another popular option. There are numerous designated campsites throughout the national park that would make for a fun experience under the stars. The times we have visited Yellowstone, we’ve stayed in Jackson, Wyoming. 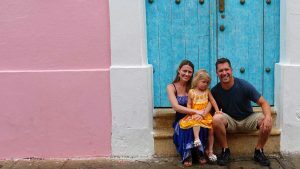 Jackson is located about 100 miles away, but it is an adorable Wild West town with plenty to do, great places to eat, and a lot more options when it comes to hotels. Have you been to Yellowstone National Park? What are your favorite things to do in Yellowstone. Leave your thoughts or suggestions in the comments below. wow, living on the east coast, its hard to imagine how big yellowstone is! Yep! It’s massive. Which is why you definitely need to plan ahead or you will be driving aimlessly. I’ve wanted to go to Yellowstone for so long! Those springs are STUNNING! It’s so sad to hear that careless tourists have tainted their beauty though. 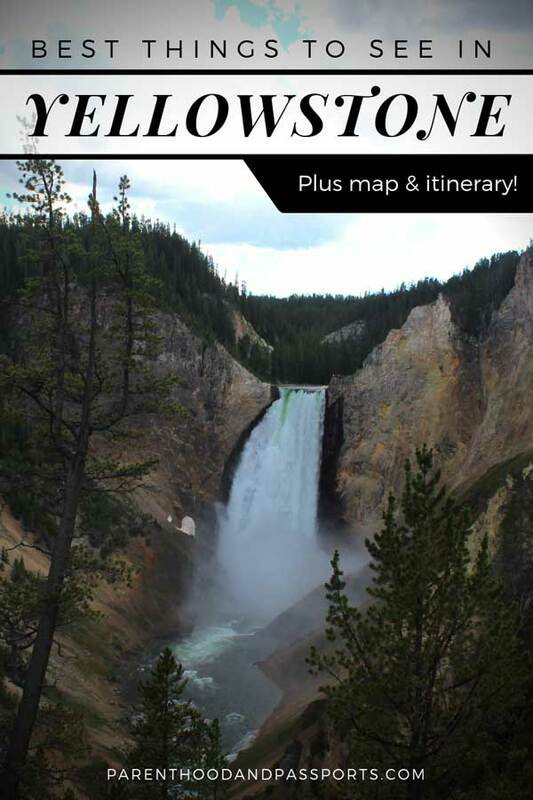 I’ve always wanted to see Yellowstone, and this is such a helpful guide. I feel like you’ve done half my planning for me, so I have no excuse not to visit now. 🙂 PS: Love the photos! The photos are just so stunning! Your post has some great suggestions but I keep getting distracted by all the photos, hehe! It’s easy to take great photos at Yellowstone. Haha! Thank you! Thanks for the helpful information. Yellowstone is an area I’ve always wanted to visit and your photographs have inspired me to do a bit more planning! Great guide! I’m hoping to visit next year and this will certainly come in handy. Love the colours of those springs, wow! Grand Prismatic is definitely the most colorful. But really all the hot springs are beautiful.